Mimulus 'Sunshine' is thought to be a natural hybrid of Mimulus aurantiacus and was selected for its abundant, large yellow blooms and vigorous growth habit. The cheerful flowers contrast beautifully against the monkeyflower’s rich green foliage. 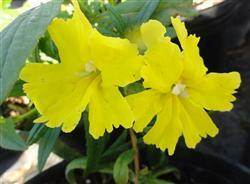 ‘Sunshine’ monkeyflower grows in a low mounding, compact form about 1-2 feet in height. The sunny yellow flowers brighten up borders and rock gardens, flowering almost year round in a coastal setting. Inland the flowering season is not quite so long. We recommend trimming and pinching back to maintain shape and maximize flowering. This plant is suitable for containers as well as flower borders, pathways, hummingbird and butterfly habitats, and will do well in full sun or part shade. Moderate water during the summer months will aid in keeping this Monkeyflower looking its best in all seasons.